This set of Basic IC Engine Questions and Answers focuses on “Combustion In C.I. Engine”. 1. In CI engine, combustion occurs by the high temperature produced by the compression of the air. 2. In the CI engine, the intake is air alone and the fuel is injected at high pressure in the form of fine droplets at the start of compression. Explanation: No, but actually, in the CI engine, the intake is air alone and the fuel is injected at high pressure in the form of fine droplets near the end of compression. c) period of controlled combustion. 4. The rate of pressure rise depends on the amount of fuel present at the end of delay period, degree of turbulence, fineness of atomization and spray pattern. 11) type of combustion chamber. 8. Towards the end of the compression stroke when injection of the fuel into the combustion chamber commences, the quantity of fuel discharged is spread out over a predetermined period. 9. The rate of burning does not depends on the relative movement of the burning droplets to the surrounding air charge. Explanation: In fact, the rate of burning depends on the relative movement of the burning droplets to the surrounding air charge. 10. In CI engines fuel is injected into the combustion chamber at about 15ºC ___________ TDC during compression stroke. 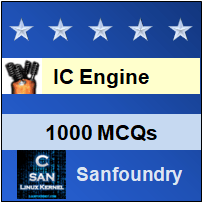 To practice basic questions and answers on all areas of IC Engine, here is complete set of 1000+ Multiple Choice Questions and Answers.